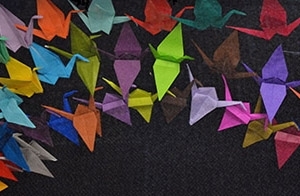 Origami cranes created at the DFM’s “Soaring Toward Change” event represent a shared commitment to addressing diversity, health equity and inclusion. The UW Department of Family Medicine’s (DFM) 2020 Initiative—a comprehensive program to address diversity issues in its patient care, education, research and community engagement missions—entered its second phase in March. Project leaderJennifer Edgoose, MD, MPH, first introduced the initiative to the DFM at a State of the Department address in October 2014. She presented alarming statistics on racial and health equity in Madison and Wisconsin: educational achievement and youth incarceration disparities between blacks and whites are higher in Dane County than anywhere in the U.S., and Wisconsin was found to be the worst state in the nation for a black child to grow up. Those inequities correlate with poor health outcomes. Black infants in Dane County die at rates much higher than white infants, and Wisconsin is the only state in which the life expectancy gap between black and white women is increasing. At the Soaring Toward Change event, DFM faculty, residents and staff brainstormed strategies to ensure a departmental commitment toward diversity, inclusion and health equity. Over the past six months, the DFM has held several events to raise awareness of diversity issues in its geographical community, its patients—and within the department itself. Through these events, DFM faculty, residents and staff from residency and community clinics statewide identified two major themes. First, the DFM must recruit and retain more diverse faculty, residents and staff; and second, it must deepen community engagement through more diverse patient advisory groups, stronger partnerships, inclusion of community members in teaching activities, and creation of a community advisory board. “It is clear that the demographics of our communities are rapidly changing around us. Our department does not reflect this change and, perhaps, in our inattention we are complicit in the astonishing disparities that have arisen around us,” Dr. Edgoose said. Now, the DFM is developing a concrete diversity plan focused around five key concepts: Training, Recruiting, Unlearning and learning, Sustaining and retaining, and Tracking (or TRUST). It’s also forming a new diversity committee that will provide representation and advice on diversity issues that affect all parts of the department. The committee’s first order of business will be to join the DFM’s executive team in the Women in Science and Leadership Institute’s Searching for Excellence and Diversity Workshop. That workshop teaches leaders how search committees can approach diversity, how unconscious assumptions influence candidate evaluations, and how to ensure fair and thorough candidate reviews. In the future, the committee may investigate education pipeline opportunities, explore a diversity curriculum in the residency community medicine clerkship, and review mentoring processes for underrepresented minorities. “Our remarkable department was among the university’s pioneers in breaking the glass ceiling for women in leadership. Let us again explore the many barriers that still remain for so many,” reflected Dr. Edgoose. For more information about the initiative as it evolves, visit https://fammed.wisc.edu/diversity/activities/2020-initiative/.